Kibin is a proofreading and editing service aimed at students who want a professional to take a look at their academic work. They claim to improve your paper on various levels, rather than just proofread for possible mistakes or misspellings, and state their editors are all skilled native-level English speakers from around the world. Kibin.com provides editing and proofreading for a variety of academic papers, from essays and lab reports to personal statements and admission essays. They state they will improve sentence structure, wording clarity and idea flow, but what they will not do is write custom papers. Therefore, if you’re looking for more comprehensive help with your assignments, this is not the service for you. Kibin also provides an extensive essay database with over 500,000 paper examples to help students brainstorm ideas for their assignments, but it is available only via subscription. Furthermore, there is also a free Thesis Builder tool to help you develop your thesis more easily, and they also provide free advice and writing tips on their blog. The prices for their editing services are quite steep. The price depends on the word count of your paper and on the turnaround time requested. For example, a 1,000 word essay will cost you $35 if you want it within 72 hours, while a 3-hour deadline will have you forking out $49, 50! This is steep, considering you can have a professional writer craft you a quality custom paper from scratch for a much lower fee. As for the subscription mentioned earlier that grants you access to their essay database, you can choose a yearly plan, which will cost you $95.40 per year or a monthly one, which adds up to 24.95 per month. We couldn’t find any Kibin discount codes or price reduction for first-time or returning customers, as is customary with such services. And this a shame, considering the high rates they are charging. They do have, however, a special offer for those who opt for one of their subscription plans: if you choose the monthly package, you get a $25 credit which you can use for professional editing, while the annual plan will grant you $100 essay editing credit per year. We ordered editing for a 500 word essay to be delivered within 72 hours. We purposefully left some grammar mistakes and punctuation problems in the text, as well as some unclear or rather awkward sentences. We received the paper a day early, but what the editors did was rather more proofreading, not actual editing. They did correct all mistakes and set the right punctuation, but didn’t change much else in terms of syntax and word choice – and the text could have used improvements in those areas. Kibin.com offers plenty of ways you can contact them: an email address, a variety of social media accounts, as well as live chat. We couldn’t find any phone number, though, which is not exactly reassuring. Also, note that, while their editors are available 24/7, their customer service isn’t. We’ve tried their live chat in the evening and received a reply only the next day, as it seems that their support team is available only Monday to Friday, from 9 am to 5 pm (EST). This is quite an issue, as if you’re not happy with their editing, for instance, and need to turn in your paper ASAP, you might not be able to get any help from their representatives in due time. So, is Kibin.com legit? It certainly is. But is it worth your money? It’s up for you to decide, but we think you can get much more comprehensive services for a lower price elsewhere. This is a registered company that provides its clients with writing and editing services in academic and business. The writes in the company have adverse knowledge in the field hence the custom written assignments are total from scratch. The writers follow stringent measures and adhere always to customers specific request .The company provides its services on time emphasizing on authenticity of its materials and money back guarantee if needed. The company has made its platform easy to use hence no extra computer skills required. The customer service offers are of its top notch with the customer service support available 24/7.The company also provides dissertation papers that are of high quality. This review is going to expound more on the company’s services, price and also its features. 911essaywriting.com gives you various features that other providers do not offer. When you place an order, you can just relax and let experts handle everything. Clients are guaranteed of 100% custom writing service. The writers of the company all have MA and PhD degrees. Academic papers are properly cited depending on the citation format. They offer free outline, amendments, title page, bibliography and formatting which saves you money. If you have any question or concern regarding the writing services that they offer, the site provides 24/7 customer service support. To get a discount, you can just use the discount code 911essay15 and get 15% discount when you place your order. There are services that deliver average content and services that disappoint. Then, there are services that amaze. It’s not easy to find a service of this last category, but sometimes we end up surprised by the quality and expertise of some writers. ProEssayWriting.com achieved that impression. It’s a high-quality writing service that connects you with real experts. We didn’t write this review solely upon examining the website. We ordered papers to reveal the true picture for our readers. At first sight, the list of services isn’t impressive. You can see that the service delivers the following types of papers: essay, coursework, research paper, term paper, and dissertation. However, there’s a category named college paper, which is pretty broad, so practically any type of content can fit in it. The order form includes many other types of papers. You can also get a book review/report, movie report, thesis/dissertation proposal, research summary, and many other types of content for all levels of study. The website is very transparent. 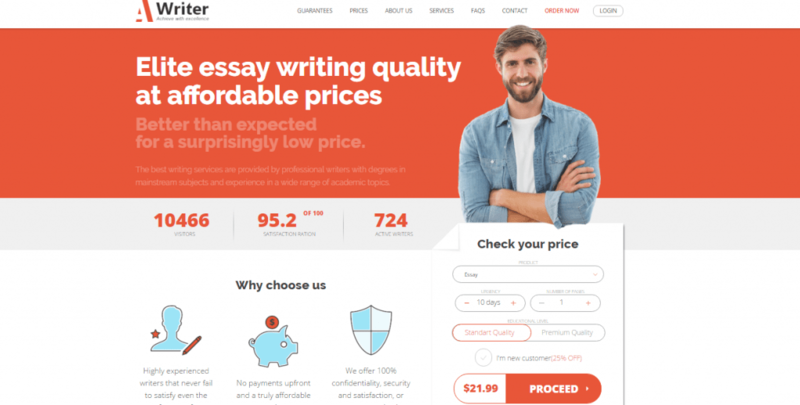 It’s easy to see the prices and discount offers at ProEssayWriting.com. If you order an essay of Standard Quality with a deadline of 10 days, you’ll pay only $19.99 per page. That’s an affordable price given the fact that you’ll work with a graduate-level writer. If you want higher quality and shorter deadline, the price per page will be higher. For essays, the quotes range up to $52.99. Will you get a discount? That’s important, especially if you’re ordering a lengthy paper. Good news: yes, you’re getting a discount! For first-time, users the discount code gives 20% off the final price. There’s also a loyalty program – permanent discounts of 5%, 10% and 15%, which you gain throughout your orders at the site. You don’t need a code for these. The price reductions will be automatically applied as you keep ordering more pages. Now, the main part: what’s the quality like? The first thing our team did was an evaluation of the website. We agreed that the guarantees were strong and the site was easy to use. In order to write a ProEssayWriting review, we had to test the writers in action. First, we ordered a history essay. We gave the broadest topic we could think of: the Middle Ages. We left the writer with great flexibility to choose a specific topic and write a paper suitable for a college-level student. The result was outstanding. The writer focused around a specific topic and provided a strong discussion with proper references. Then, we decided to check how this team performed under close supervision. This is a service that allows you to message the writer via a chat feature. We did that a lot. We ordered a whole research paper of highest quality level and we wanted to make sure the writer followed instructions. We asked for some revisions along the way and the writer closely followed the requirements. The end result was, to our impression, perfect. The customer support center at this site is available 24/7. We contacted the agents few times via chat and they were very attentive. You can also get in touch with the support via phone and email. We tried that; those options work well, too. Let’s not forget to mention that the communication with the writer went as smoothly as possible. We tried many writing services before. The competition is really huge. There are many websites that deserve good remarks. However, ProEssayWriting.com deserves a spot among the best writing services on our list. We were very happy with the quality and the service we got.